If You Think Your Dog is Dominant, Watch This! If You Think Your Dog Is Dominant, Watch This! from Carolyn Lincoln, DVM on Vimeo. Do you think your dog is dominant? The Alpha? The boss? Then watch this video because it just isn’t true. It’s about respect and respect goes both ways. “Your dog doesn’t respect you. Don’t you dare let him get away with that. Grab that collar and show him who’s boss.” Have you heard that before? What do you think when you see this video? You see how my dog is barking and running around, not paying attention to me? Or so it seems? What the real problem here? Is it that she doesn’t respect me? I’m Dr. Carolyn Lincoln with Play to Behave and you can find out more about me at playtobehave.com. 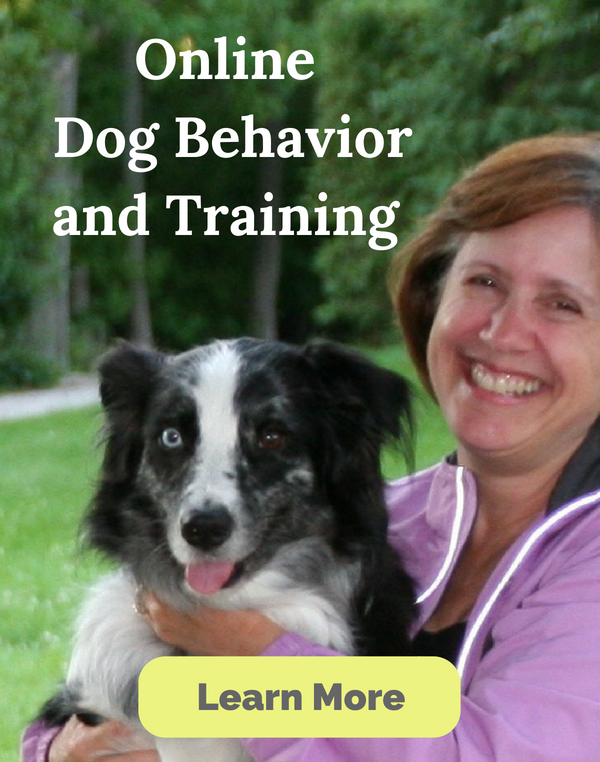 I’m a veterinarian, professional dog trainer, and agility competitor. You’re watching Ray and me when we were new at agility. Well, we’re still new at it, and it’s my job to tell Ray where she goes next. I can’t just use words, I have to use my body language, and it’s not easy to do. Especially with a dog at her speed. But she’s not dominant over me. She is respecting me. How do I know that? Because I’ve already been through this with another dog, where I was told repeatedly in the early years that I was learning that she didn’t respect me. But she did everything I asked at home. She waited whenever I told her to wait, she always wanted to be with me, and she was extremely affectionate. So, why–and her name was Pepper–why would Pepper bark and jump at me when I was on the agility course with her? Because I wasn’t telling her what to do and she was frustrated. She didn’t know what to do, all she wanted was for me to tell her what to do. I have to tell her, and it’s hard when you have a fast dog because you have to think and react faster than they do. We can’t just use words because words aren’t very meaningful to dogs. It’s all about the body language. It’s the speed I’m going, the location I am, the direction I’m facing. There are many things I can do to tell my dog where to go next, and this isn’t about disrespect. If you really care about your dog, you need to respect them as much as you want them to respect you. You need to look at the environment, look at everything around you, understand why your dog is doing what they’re doing. Think about their health. Could there be something that’s bothering them? They can’t hear you, they can’t see you, they’re in pain… there’s a lot of reasons dogs don’t behave the way that we expect or the way that we want them to. You need to build your relationship based on understanding, communication, and trust, and once you do that, you’re going to get the behavior that you want. Your dog wants to please you in the worst way. They’re born that way! It’s a rare dog–there would have to be something terribly wrong with them for them to not want to do whatever you’re asking. But if you don’t teach them what it is you want, if they don’t understand you, or if you’re hurting them, ruining the trust that you’re building together… then, yeah, your dog is not going to listen to you. I’m Dr. Carolyn Lincoln with Play to Behave. If you want to learn more, go to playtobehave.com. Have a good time with your dog. Go enjoy them, love them, and have happy times training together. I hope you’ll come back and see me again.